Yoga is done for a healthy mind, body and soul. Doing Yoga with partner can make it fun. It strengthens the bond between two individuals. Enjoy a calming session with your partner. Yoga is something that brings you calmness, serenity, mental peace, health and much more other lifestyle benefits that you are not aware about. Yoga can almost cure any disease you are suffering with; it can heal your mind, body and soul. What if we tell you that you can let your partner reap the benefits of yoga with you? 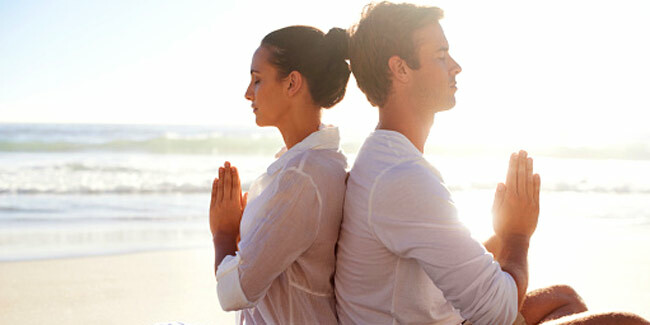 Yes, there are yoga poses that you can perform with your partner. Stand facing your partner and then start with folding forth at your hips. Touch hands with your partner. Now, start folding forth until your forearms, elbows and hands are resting against each other. Hold the position for a couple of breaths and then get back to your previous position. Sit back against back with your partner, you both need to bend your knees and place the soles of your feet together. Keep your backs straight. Now, when one partner bends forward while the pther partner will lean backwards, still resting his/her back against their partner’s back. Hold the position for few seconds and then change the position. This pose is a bit sportive. Both the partners are required to stand, facing the same direction with arms spread wide in a tree position. Make sure you both touch each other’s palms. Now, fold your left knee and position your left foot in such a way that it touches the inner thigh of your right leg. However, your partner will get into the same position, with right knee bent and right foot touching the inner left thigh. Try to balance, support each other. Hold the position for about five breaths. This pose is done in more of a meditative manner. Sit back against back with your partner, legs crossed and eyes closed. Now, this pose is about breathing. You breathe in while your partner will breathe out. Feel the breathing of your partner, the sensation of inhaling and exhaling. You don’t see your partner, just fee his breathing and that is the only presence you sense. Quite similar to the breathing pose. Sit back against back with your partner, legs crossed and eyes closed. Now, this pose is about breathing. You breathe in while your partner will breathe out. Just one difference and that is when you are required to twist towards your right and try to touch your partner’s left knee and while your partner is supposed to do the same, only from the other direction. Inhale and exhale for about six times and then change directions. Read more articles on Mind & body.